If you’re on a mission to bring home a new dog and have your eye on the adorable Scoodle crossbreed, you’re not alone. The Scoodles’ popularity is steadily growing, yet there is still so much you may not know about him! Don’t worry, this article is entirely dedicated to all things Scoodle in hopes of helping you decide if he would be the perfect pup for you. So just who is the Scoodle dog? Read on to find out! The Scoodle, also affectionately referred to as the Scottie Poo, the Scottish Schoodle, the Scottish Terrierpoo, and the Scottish Terrier Poodle mix is a cross between the purebred Scottish Terrier and the purebred Poodle. By all accounts, this crossbreed is equipped with good looks, lots of smarts, and tons of personality! However, the Scoodle is a first-generation crossbreed, meaning there are likely to be many unknowns about him. But what exactly is a crossbreed and why is there controversy surrounding the topic? Why Is There a Designer Dog Controversy? As previously stated, the Scottish Terrier Poodle mix is a crossbreed, meaning he is the offspring of the purebred Poodle and the purebred Scottish Terrier. You may also have heard the term designer dog or hybrid dog. These are all terms used to refer to a crossbreed, such as the Scoodle. But if the Scoodle is a mix between more than one breed, doesn’t that make him a mutt? While this question is part of the debate when it comes to crossbreeds, supporters of the practice insist there is a big difference between mutts and crossbreeds. By definition, a crossbreed is a dog who is the offspring of two specific breeds. A mutt has a lineage of several different breeds in his bloodline. To learn more about this subject, visit us here. The rest of the controversy regarding crossbreeding is a bit more complex. It’s no secret that purebred dogs are prone to many inheritable health issues as a result of overbreeding throughout generations. Supporters of crossbreeding claim that crossbreeding could be a solution to these genetic health defects. Others shake their heads at the notion, however. They state that crossbreed dogs can be just as susceptible to certain health defects as purebred dogs, if not more so. If you are interested in learning more about other common objections of crossbreeding, click here. The studies are still ongoing regarding the controversy. While we may not know for sure yet if crossbred dogs are healthier than purebreds, it’s still important to know as much about your potential crossbreed before you get him. So with that in mind, let’s learn about the history of the Scoodle. The Scoodle dog is still a first-generation crossbreed, meaning he hasn’t been around very long. For that reason, his exact origin is vague, but we can still get an idea of his lineage and what makes him so unique by looking into the histories of his purebred parents, the Poodle and the Scottish Terrier. We’ll start with the Poodle. The Poodle is a famous dog, known for his fanciful haircut and prim-and-proper reputation. Commonly believed to have hailed from France, the Poodle is now thought to have come from Germany over 400 years ago. Originally duck hunting dogs, Poodles were renowned for their swimming abilities. In fact, this is where their flamboyant haircuts come from. Cutting the Poodle’s thick curly fur short in some areas while leaving it puffy in others helped to protect the dog from the harsh elements of the water as he swam after his pray! Later, the Poodle became a sort of fashion statement amongst nobles in France, and his ability to delight the masses made him an excellent entertainer as well. It wasn’t uncommon to find a Poodle starring in the circus or performing street shows. Today, the Poodle is an incredibly popular family pet, adored for his intelligent mind and family-friendly demeanor. Ranking in at number seven out of 194 on the American Kennel Club (AKC) list of most popular dog breeds, the Poodle comes in three size varieties, including standard, miniature, and toy. True to his name, the Scottish Terrier, or Scottie as he is sometimes called, hails from the Scottish Highlands where he earned his keep by hunting rats, foxes, and badgers. The Scottie is an ancient breed, with some experts surmising he is the oldest of the Highland Terriers! Despite his origins as a farming dog, the Scottish Terrier became popular with royalty, particularly in the17th century when Scottish born King James l began giving the Scottish Terrier to his friends and acquaintances as presents. Scottish Terriers made their way to America in 1883 and were officially registered by the American Kennel Club just two years later. History buffs will recognize that perhaps one of the most famous Scotties in the US belonged to President Franklin Delano Roosevelt during World War II. Not as popular as the Poodle, the loveable Scottish Terrier sits at number 58 on the AKC’s most popular breeds. So with histories as fascinating as the Scottie and the Poodle, it’s no wonder the Scoodle crossbreed is becoming more and more sought after. Now, what can we expect the Scoodle to look like? What Will My Scoodle Look Like? Since the Scoodle is a crossbreed, pinpointing his looks as specifically as we can with purebreds is nearly impossible. The Poodle and the Scottie vary greatly in appearance and their offspring, the Scottie Poodle mix, could inherit a variety of characteristics from either purebred parent. 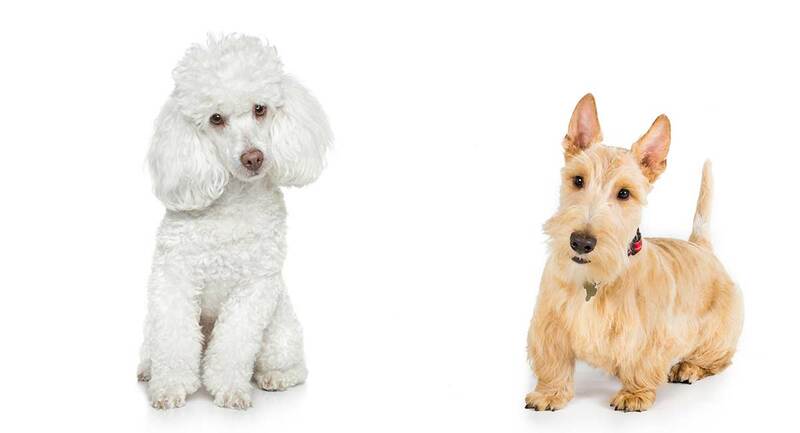 It’s really going to be left up to chance and genetics, but to get a better idea of what the Scoodle could look like, let’s take a look at the physical appearances of the Poodle and the Scottie. While they do come in three size varieties, the miniature Poodle is most likely going to be selected to breed with the Scottish Terrier to create the Scoodle. The Miniature Poodle weighs 10 to 15 pounds and stands at about 10 to 15 inches. The Scottish Terrier, on the other hand, weighs an average of 18 to 22 pounds and stands about 10 inches tall. The size of your Scoodle will depend on the size of its Poodle parent. Since odds are that the Poodle parent of your Scoodle will be a miniature Poodle, you can most likely expect your Scoodle to be a small to medium-sized dog. Both the Scottish Terrier and the Poodle are hypoallergenic, meaning they do not shed. They are therefore great for those who suffer from allergies or don’t want to deal with loose hair around the home. The Scottie is more compact with a longer body and shorter legs. He has a wiry top coat that covers a softer, very thick undercoat. Remember, since the Scoodle is a crossbreed you could get any variety of the above defining characteristics. However, you can expect him to be hypoallergenic with textured hair that will either be curly or wavy. But what about the Scoodle’s temperament? Keep reading to find out! The Scottie Poodle mix is known for his playful nature and loyal disposition. Like his purebred parents, the Scoodle is most likely going to be confident, spunky, and intelligent. But what else could he inherit from his Poodle and Scottie parents? Well, just as with looks, the Scoodle temperament is going to depend on genetics. Will he be athletic and proud like the Poodle, or independent and spirited like the Scottie? If your Scoodle takes after his Poodle side, you can expect him to be very brainy with an affinity for showmanship and a love of water. However, if your Scoodle ends up favoring his Scottie heritage, he could be feisty and self-assured and very playful! Your Scoodle could also get a range of both characteristics from purebred parents, and you won’t know until you have him. This is part of the controversy of a crossbreed dog. Luckily, both the Poodle and the Scottie are known to do well in family settings with older, more respectful children. They are adaptable dogs who do great in many home settings as long as their exercise and play requirements are met. And while the Scoodle by all accounts makes a friendly and easy-going family dog, we always recommend early socialization and obedience training to ensure he is healthy and happy from an early age. Both the Poodle and the Scottie require lots of maintenance when it comes to grooming, so you can expect for your Scoodle to require a similar amount as well. The Poodle, for example, needs to be brushed daily if his owners choose to maintain a typical Poodle cut. However, there is the option of trimming his hair short and giving him a more manageable cut. For the most part, Poodles require professional grooming. The Scottish Terrier needs grooming at least three times a week and hand stripping of his wiry coat. If owners choose to clip their Scottie’s coats, the dense undercoat will “take over” and it is easier to manage, with upkeep lasting up to six weeks. Both breeds will require occasional bathing and will need their nails trimmed regularly to avoid breakage. Their ears should be cleaned regularly to avoid infection. Despite being hypoallergenic, a prospective Scoodle owner should prepare for some upkeep when it comes to grooming, since both the Scoodle’s purebred parents have more demanding coats. The Poodle is highly intelligent and eager to please, while the Scottie is more independent and doesn’t tolerate long training sessions. Since the Scoodle is a cross between the two, the ease of training him will depend on the traits he inherits from his purebred parents. The most important thing to remember is to always use positive reinforcement and kind words. Keep training short, not lasting longer than fifteen minutes, and allow for plenty of positive rewards. Never use harsh words or scolding when trying to train your Scoodle. It will not help him to learn quicker and, in fact, may hinder the lesson. As previously mentioned, we recommend early socialization and obedience training to help ensure you Scoodle is well rounded throughout his lifetime. Nailing down any specific Scoodle health issues could be complicated, considering he is a crossbreed. However, by taking a look at his two purebred parents you can prepare yourself for the possible health issues your Scoodle may face. Since your Scoodle is a crossbreed, early health screening could help you avoid or prepare for future issues he may inherit from his purebred parents. What Is the Ideal Home Type for the Scoodle? By all accounts, the Scoodle is a friendly dog who does well in family settings and enjoys playtime, children, and other household pets. However, keep in mind that grooming him could prove trying as both his purebred parents require some serious upkeep when it comes to their coats. Also, the Scottie is a bit more independent than the Poodle, and if your Scoodle inherits this trait, training him could be a bit more difficult. If you have the patience to train your Scoodle and the time to exercise and groom him properly so his coat does not become painfully matted, and if you have older, respectful children who are not going to be too rough with your Scoodle, then this crossbreed just may be the right fit for you! How Do I Find a Scoodle Puppy? Scoodle puppies are adorable, but how do you get your hands on one? 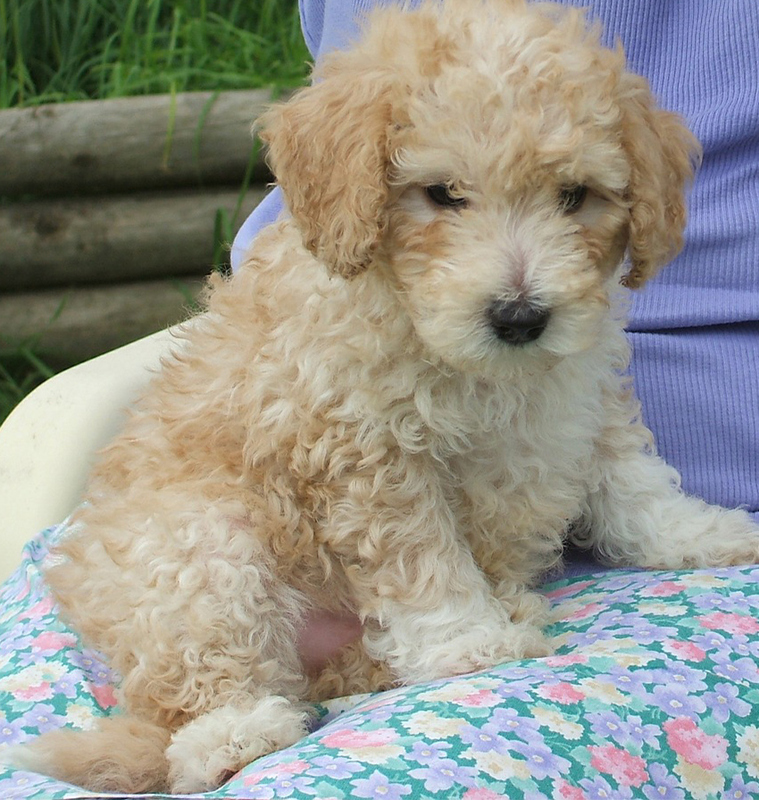 If you’ve decided the Scoodle is your perfect match, then here are our best tips for finding a puppy. When going through a breeder, prepare to spend anywhere from $500 to $1000 depending on the breeder and whether or not the Scoodle’s parents are show quality. A benefit of going through a breeder is that you’ll have the option to ask questions regarding health and temperament of the parent breeds and previous litters. Reputable breeders should also be able to provide you with certificates that prove their dogs have been health screened and are ready to go home with you. On the other hand, if you have your heart set on going through a rescue or shelter, you should still prepare for adoption fees. Typically, adoption fees will run you anywhere from $50 to $100. One of the great things about a shelter is that most will cover the initial vet fees. If you are not sure yet what recourse you would like to go through to get your Scoodle puppy, you can always try networking at local AKC club events. To find a club in your area, visit the AKC website. Good luck finding your Scoodle puppy. We hope you enjoy this unique and spunky crossbreed as much as we do! Let us know in the comments below what drew you to a Scoodle. I just lost a Scoodle after almost 13 years of unconditional love and would love to adopt another.